The Spaniards’ expectations of plentiful and easily accessible gold reserves proves unfounded, but the island still becomes important as a seat of colonial administration, a starting point for conquests of other lands, and a laboratory to develop policies for governing new possessions. At Española the Spanish crown introduces the system of Repartimiento, whereby Peninsulares (Spanish-born persons residing in the New World) received large grants of land and the right to compel labour from indigenous people. Christopher Columbus reaches a large island in what later comes to be known as the Caribbean Sea. It is inhabited by the Taíno community who call their island Ayiti. Columbus promptly claims it for the Spanish Crown and names it La Isla Española. Historians estimate more than 80 per cent of Haiti was forested at the time. The newly established French West India Company takes over and renames La Isla Española, Saint Domingue. Thousands of hectares of forest are levelled to plant sugarcane, cotton and coffee. Slaves are brought from Africa to work the plantations. Saint Domingue is the richest French colony providing 11 million francs of its total trade of 17 million francs. By the 1770s, Saint Domingue produced about 40 per cent of all the sugar and 60 per cent of all the coffee consumed in Europe. About 60 per cent of Haiti is under forests. A strong earthquake devastates Port-au-Prince, capital of Saint Domingue. Buildings are flattened and 200 people die. The relatively low death toll is attributed to a rumbling sound that precedes the earthquake, which people took as a warning and left the buildings. But more than 30,000 die in the aftermath, from famine and food poisoning. Thousands of slaves escape in the disorder, setting the stage for revolts. Slaves in northern Saint Domingue stage a revolt. Within hours, the northern plantations are in flames. The rebellion spreads across the colony and by the early years of the 19th century most French colonists flee. An army of former slaves led by Toussaint l’Ouverture and Jean Jacques Dessalines defeats a French army led by Napolean Bonaparte’s brother-in-law Charles Leclerc. Saint Domingue is renamed Haiti after its Taino moniker, Ayiti—the land of the high mountains. It is the first republic of the former slaves from Africa. usa and Europe do not recognize the republic. Fearing Haiti will foment rebellion among slaves there, usa along with France repeatedly invade it. Trade blockade cripples Haiti’s economy. France finally agrees to recognize Haiti, but at a price. Haiti has to pay 150 million francs as an indemnity to the French planters who lost their land in the revolution. This saddles Haiti with a debt that cripples its already floundering economy and increases the country’s dependence on France. Another treaty allows French businesses to cut down trees in Haiti. An earthquake destroys Cap-Hatien in Northern Haiti. The US daily Batimore Sun reported, “Thousands have died. Of the merchandize, which the merchants have been obliged to pile up in the public square, a great part has been stolen. The public buildings are now nothing.” Fifty per cent of Haiti still under forests. The US finally recognizes Haiti. Promises a loan to pay a part of the reparations to France but the money does not come before 1947. US businesses given various concessions including “rights” to cut down trees. The US intervenes regularly in Haiti. Haiti’s economy is a shambles. Street fights between warlords and militias, the cacos, are common. Between 1908 and 1915 no more than seven men seize the presidency and meet a gruesome end. An angry mob attacks the current President Jean Vilbrun Guillaume Sam, and in a scene of unimaginable violence, they literally tear him to shreds. It leads the US to deem Haiti unfit to be self-governed. The US Marine Corps lands and seizes control of the country with relatively little resistance. The Americans remain in Haiti till 1935 controlling the ministries of land, trade, defence and public health. 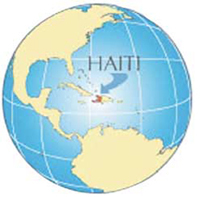 Historians believe that more than 40 per cent of Haiti’s gdp passed on to the US in this period. Beginning of banana plantations in Haiti; American companies control most of them. More forests are cutdown to make way for the plantations. 1954: Hurricane Hazel kills hundreds. 1957: US installs François “Papa Doc” Duvalier as President for life in Haiti. His brutal Tonton Macoute drive the opposition to exile. Jean-Claude “Baby Doc” Duvalier succeeds François Duvalier. The US pours in arms and trains his army as a bulwark against communist Cuba. Baby Doc virtually eliminates import tariffs for US goods; Haiti is awash with agricultural imports dumped by American firms. Rice farmers go bankrupt. Less than 8 per cent of Haiti is under forests . Jean-Bertrand Aristide, a charismatic Roman Catholic priest popularly known as the “pastor of the poor”, wins the first free elections in Haiti. Soon a military coup ousts him and he goes into exile in the US. He returns in 1994 and assumes control, but under the patronage of the US State Department. Three days of heavy rains cause floods that kill more than 2,600. Haiti’s forest cover is less than 2 per cent. January 12: quake kills thousands in Port-au-Prince. US takes control of airport.